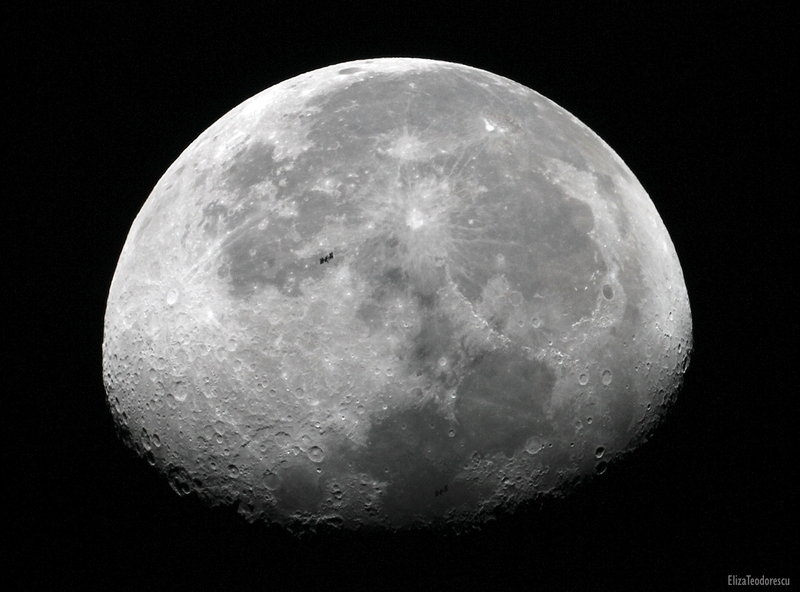 As I’ve mentioned in the previous post, a lunar transit by the International Space Station (ISS) occurred not far from my home, in Magurele (Ilfov), Romania. Together with my wife Eli, I drove for 5 minutes near a field where we’ve mounted our gear waiting almost an hour for the 0.65 second transit to occur. 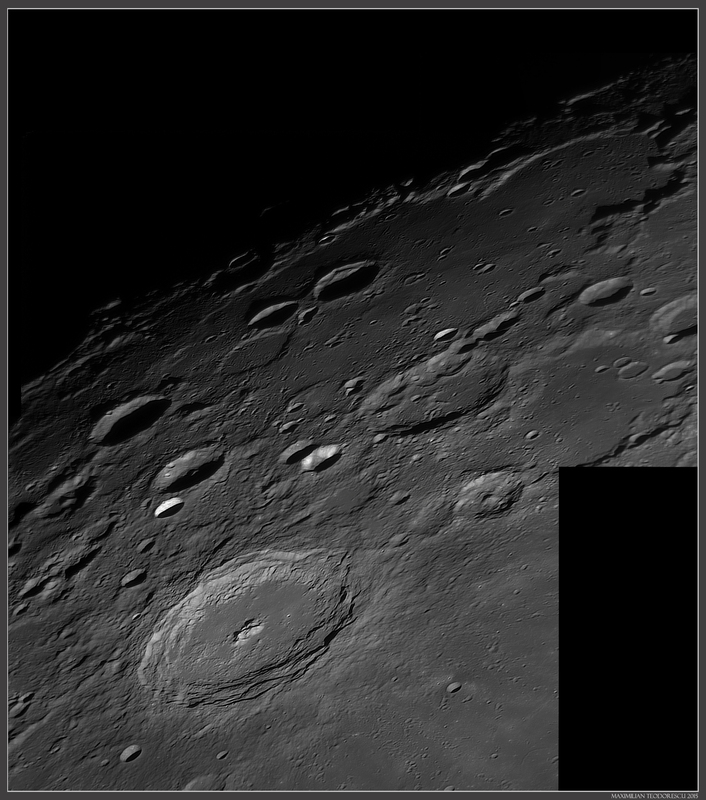 My equipment was the TS 115 mm F/7 APO with a TeleVue 2x Powermate and Canon 550D onto the EQ6 equatorial mount. 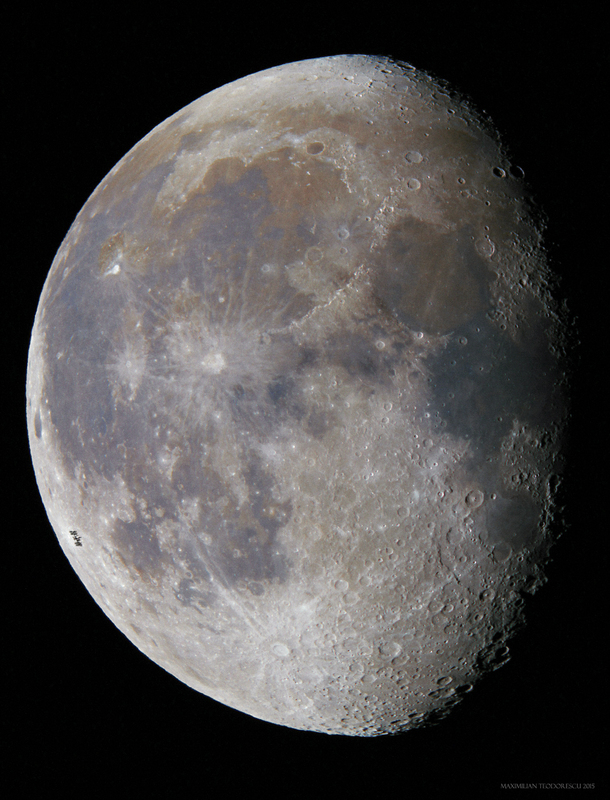 My wife used a Maksutov telescope (127 mm) and her Canon 550D placed on an EQ3-2 mount. Both of us used ISO 800 and 1/1000 s exposures. 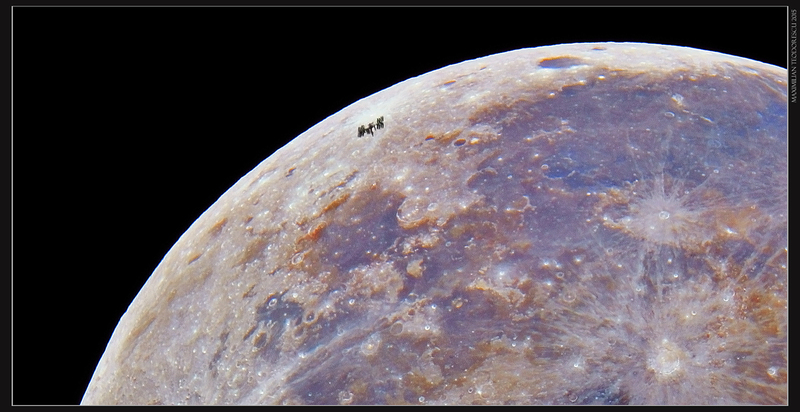 The first shot is a composite image, of one of my two frames in which the ISS was captured, overimposed onto another image which was acquired immediately after the event. 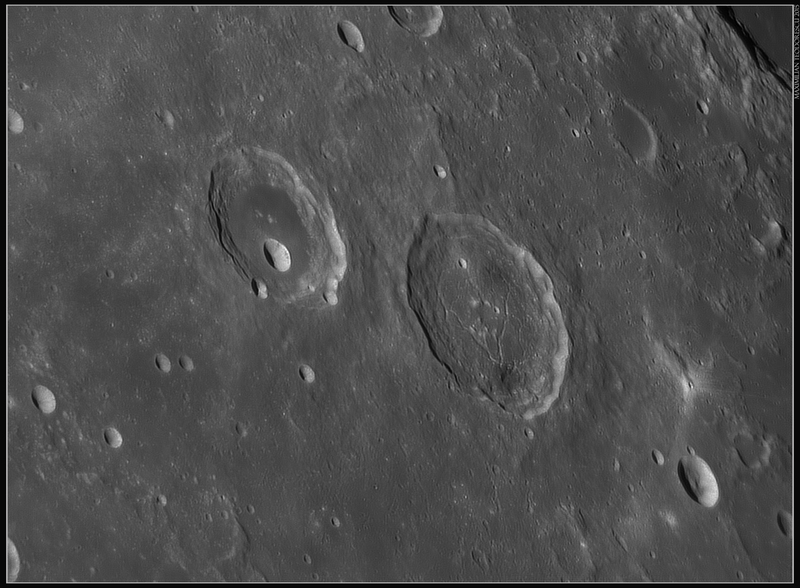 This second shot was a 72 frames stack, and was processed in order to reveal the colors of the lunar surface. 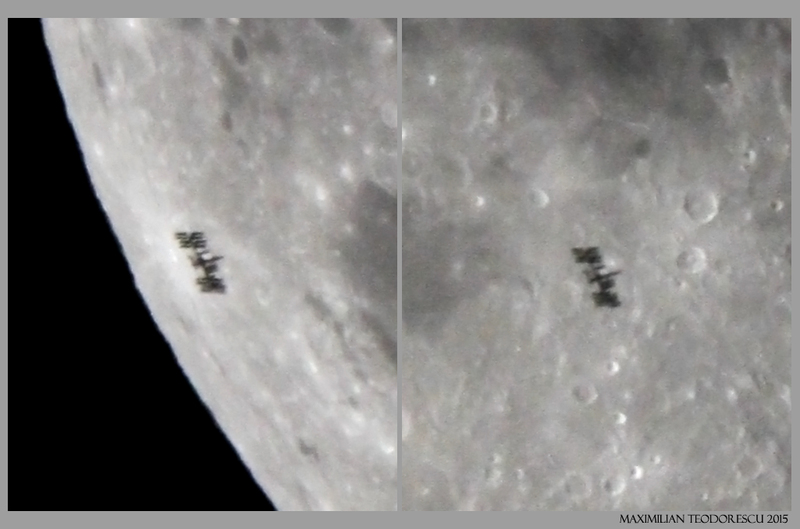 And finally, my wife’s image, with her two frames overlayed, showing the ISS’s apparent path on the lunar disc (the Station moved upward in her images). 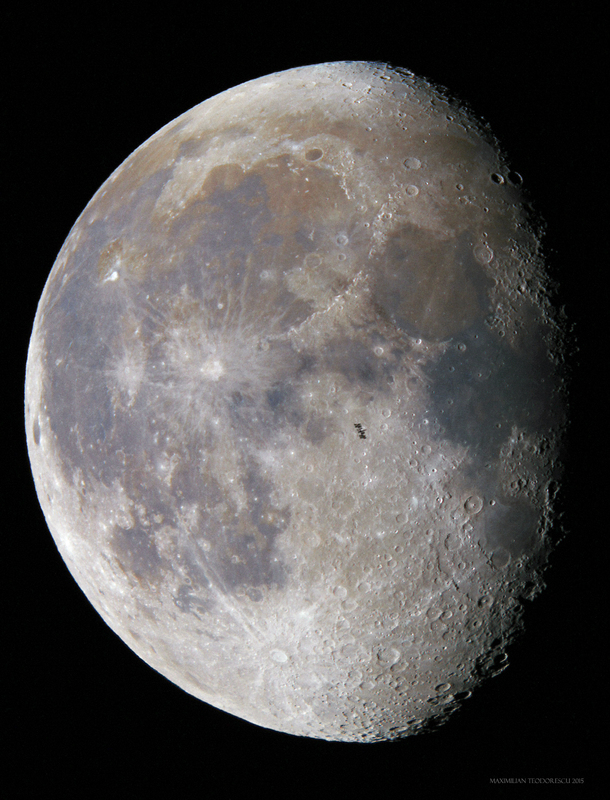 Note that the ISS is also visible, beside the obvious dark silhouette, very near the terminator, in the lower part of the Moon. 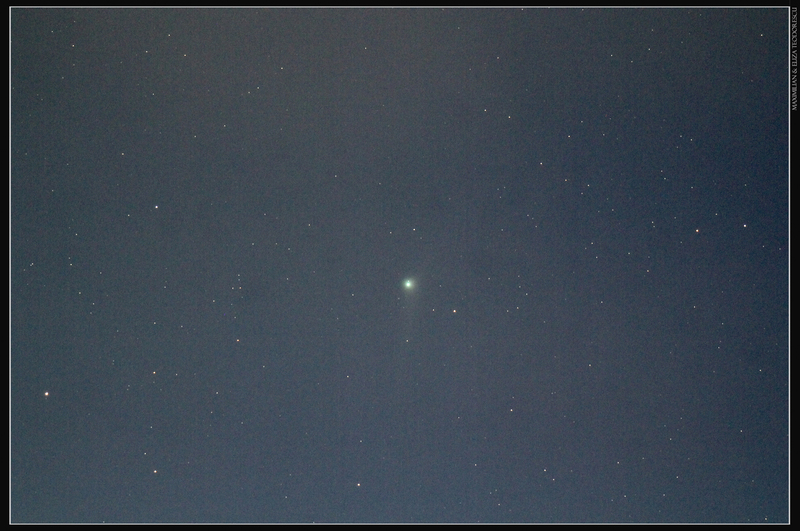 After almost two weeks of clouds and bad luck in searching for this comet, I’ve finally succeeded in imaging comet Catalina. 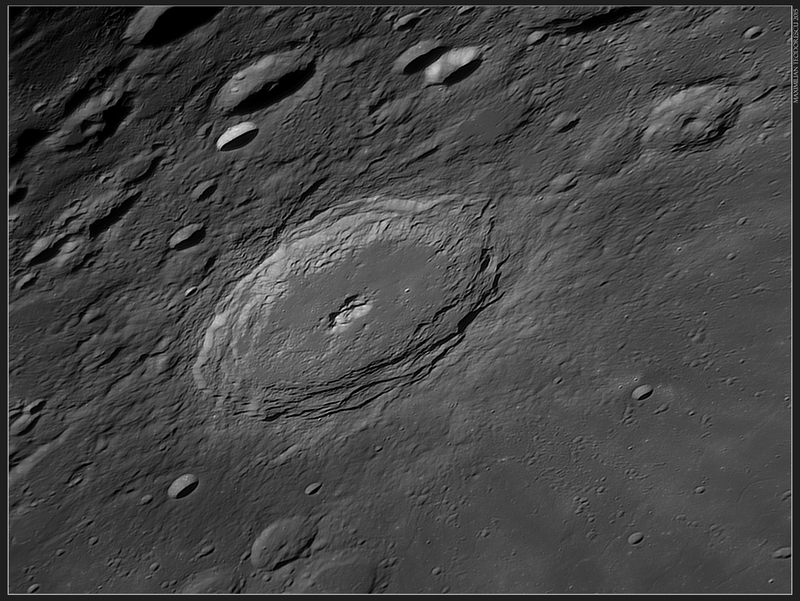 After imaging together with my wife another event, a transit of the International Space Station over the Moon (which will be posted shortly), we’ve decided to get towards the town of Fundulea, some 40 kilometers East from our location, to get ahead of the clouds. While setting our equipment in a field there, and waiting for the comet to rise, the clouds made a destructive appearance and closed the skies. “No luck this morning” we thought. On the way back, almost while we were arriving at our home, we saw a small break in the clouds, just beneath Venus, where the comet was located. A short stop on the side of the road and the mount plus a small refractor were assembled in no time, thanks to team work. Looking through the finder I’ve spotted the comet which was nicely visible as a small diffuse patch of light with a defined stellar nucleus. Only nine shots were possible due both to clouds and the advancing morning light. 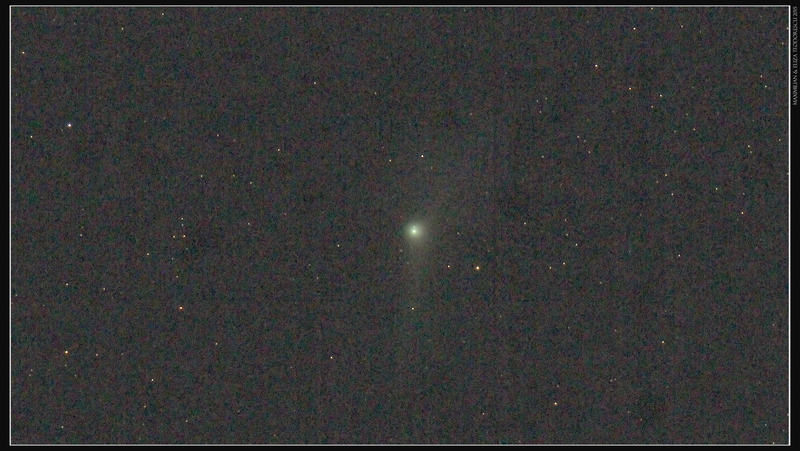 Despite all that, the two tails of the comet are visible. Equipment: Teleskop Service APO 65Q, F/6.5 (420mm F.L.) and Canon 550D on the EQ-6 mount. Only 9 frames, each a 15 second exposure at ISO 3200. 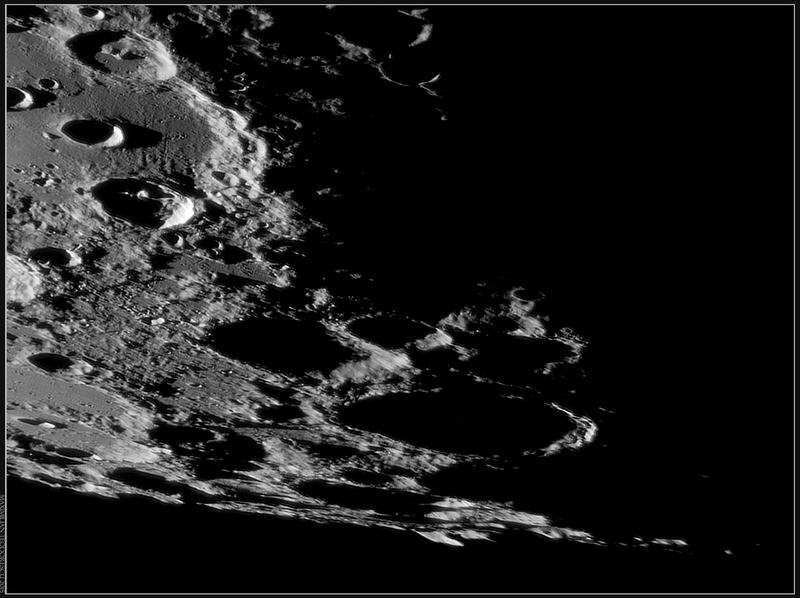 Sinus Iridum is a very large crater (240 km wide) but its missing half the rim; to better grasp the actual form of the feature I’ve transformed the perspective from the above image in an aerial one, with an almost perpendicular view towards the lunar surface. Note that the left part of the rim is almost straight. 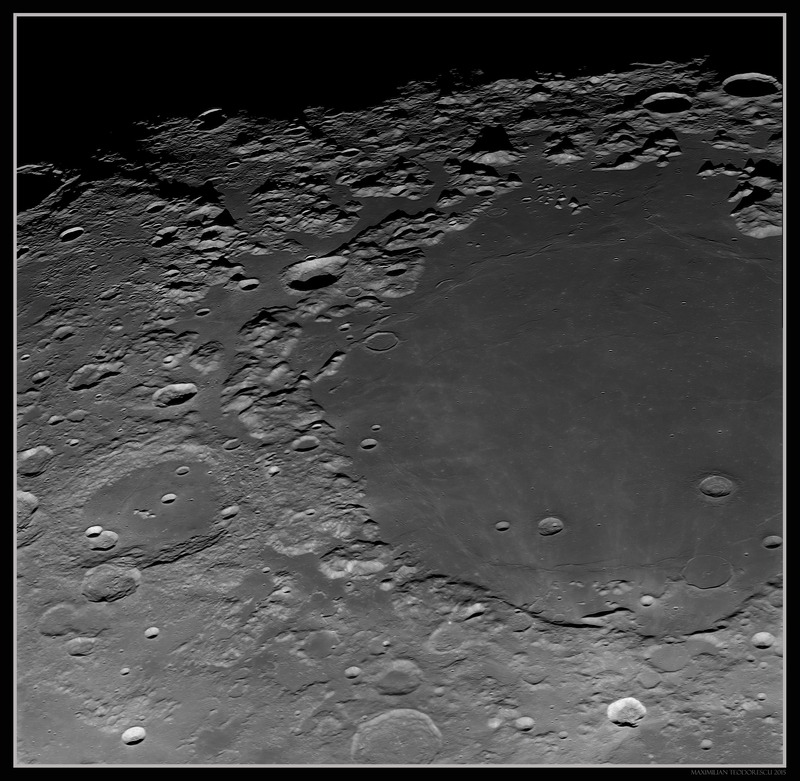 And the last image, which was actually acquired at the beginning of the session in horrible seeing conditions: a small lunar mosaic. The excellent seeing nights of September are far gone now, but November still had its good moments, despite the cold, foggy mornings. 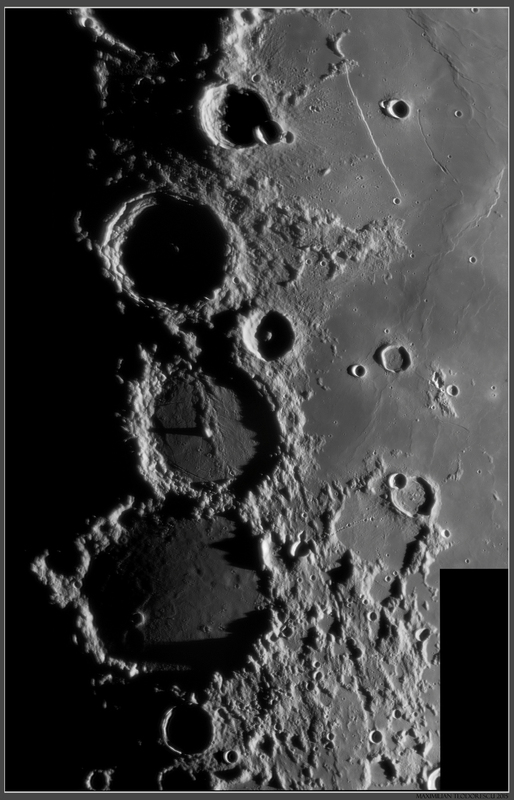 This were the conditions on the morning of November 4th, with the Moon high in the sky, a lot of fog, and dew on the secondary mirror of the scope. And unfortunately only a few very good seeing moments. Despite this, the views at the eyepiece of the 14 inch scope were fantastic. 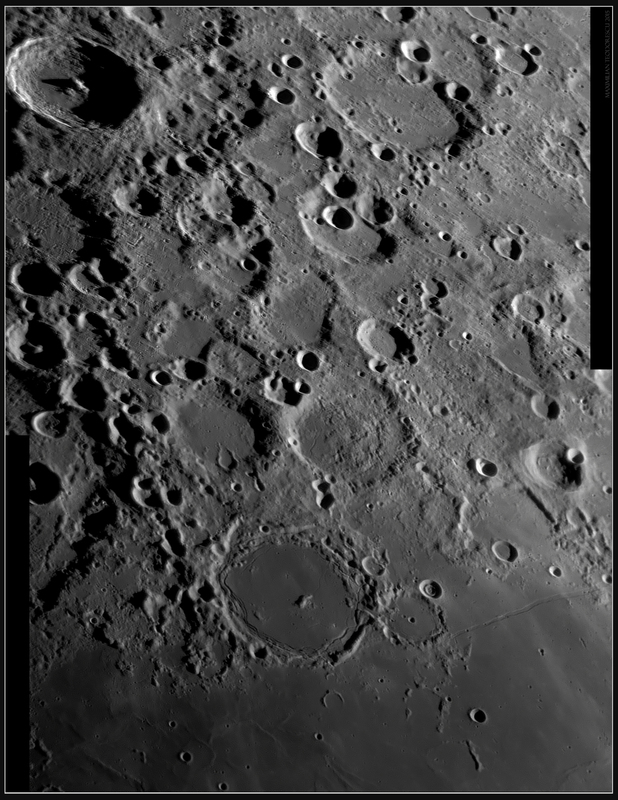 The equipment for the following shots: 355 mm F/5 homemade Newtonian (SkyWatcher optics) at F/20, ASI 120MM-S camera with a Baader Red filter. Seeing (mostly) 6-7/10. 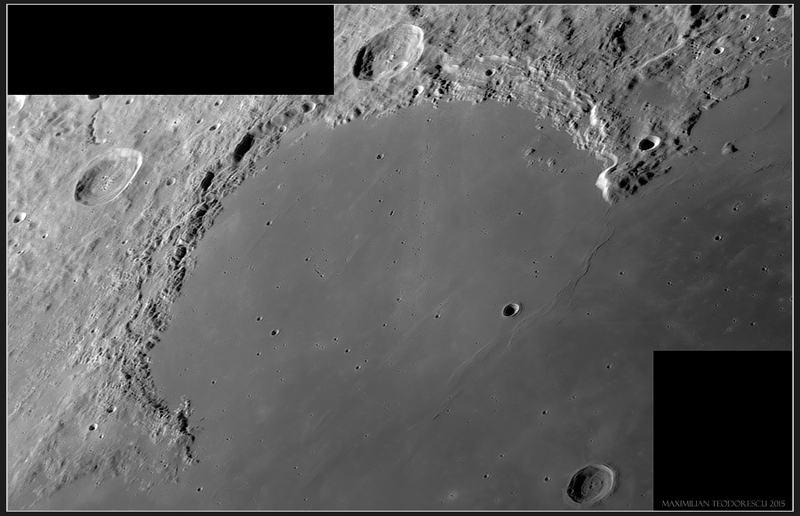 One of the larger impact craters, with half the rim covered by lava, and a future landing place for lunar-probes: Sinus Iridum (the Bay of Rainbows). 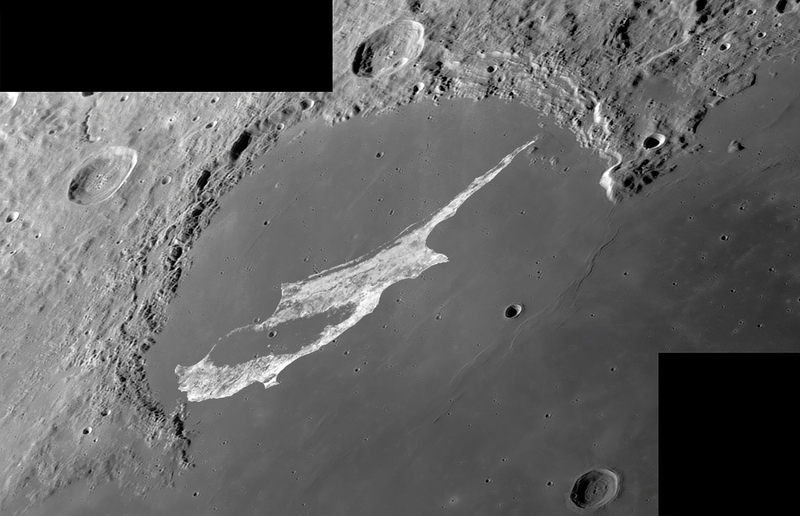 The above image is part of a larger mosaic presented below. 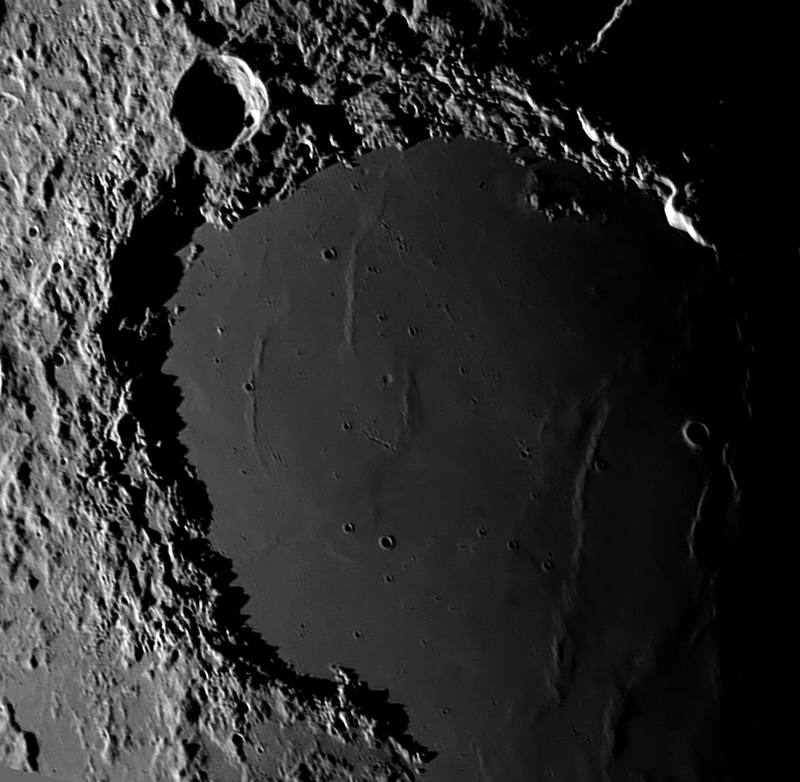 This view also includes the well-known crater Plato. 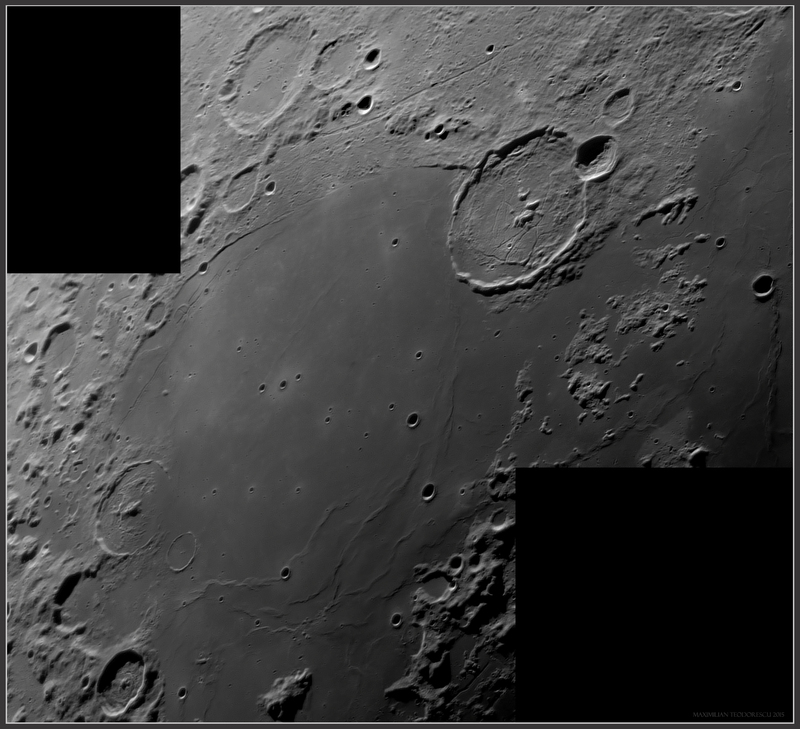 Note the smaller craters on Plato’s floor, and also the multitude of rilles all around the image. 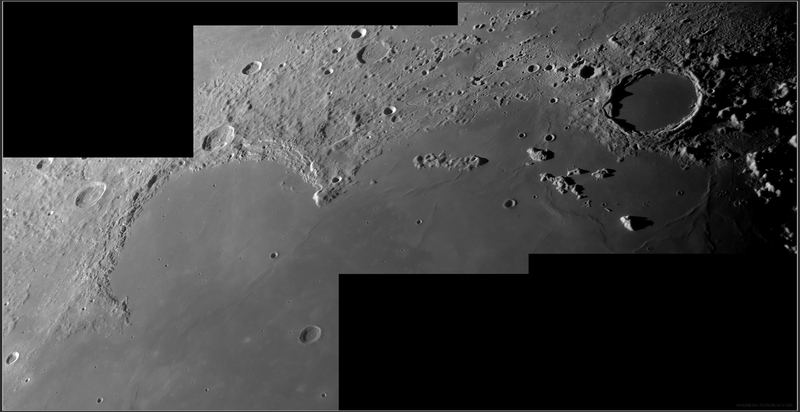 At the end, just for fun, I’ve made a comparison image of Sinus Iridum at the same scale with the island of Cyprus (the island is in white, and tilted to give the correct perspective). 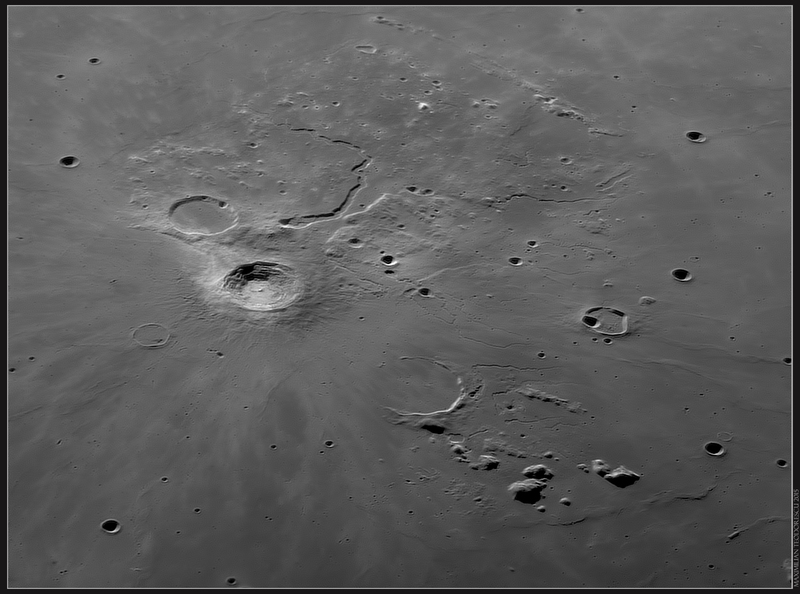 Sinus Iridum is quite a large impact crater! 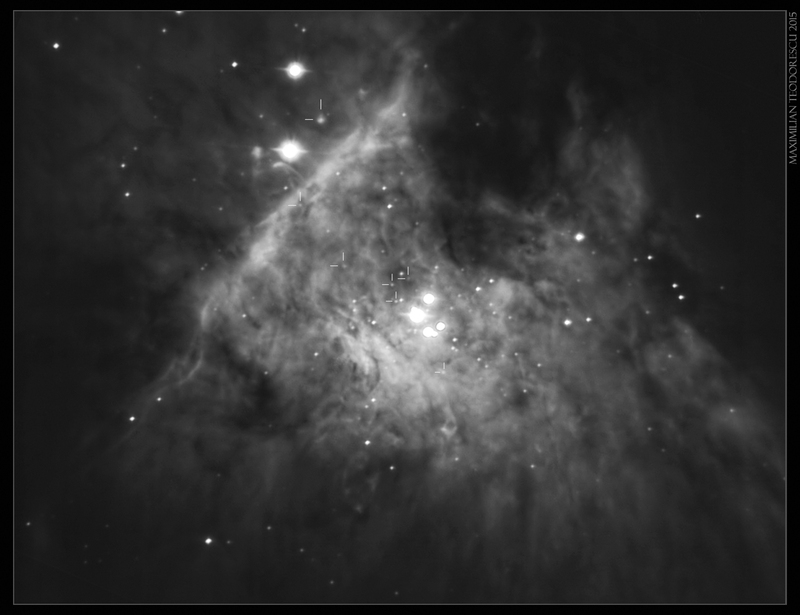 During the imaging session of November 14, I’ve spent some time imaging the core of the Orion Nebula M42. 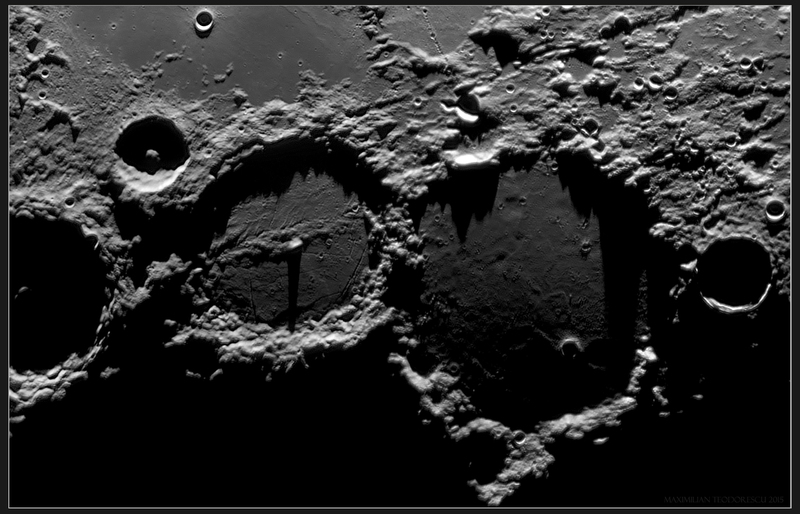 This was just as a test for a future dedicated imaging session, perhaps in a month or so. 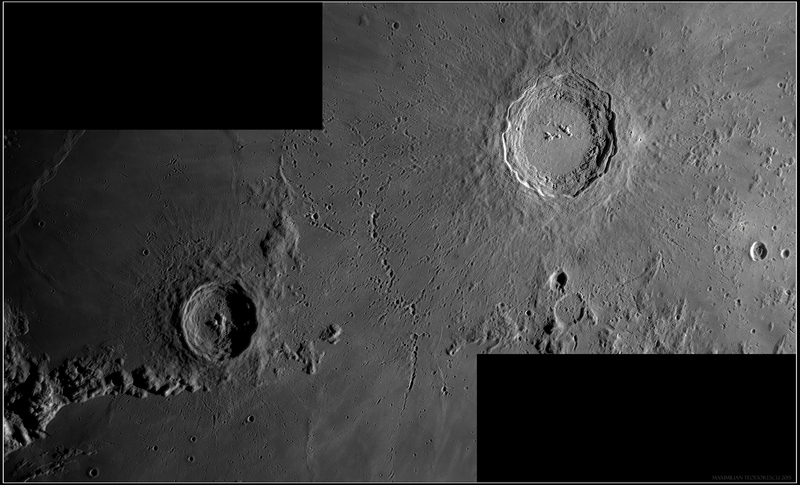 During this session, I’ve “only” acquired 1600 frames with both a Red filter and an UV/IR-cut filter using the 14-inch scope at F/5 and the ASI 120MM-S camera with 1 second exposures. 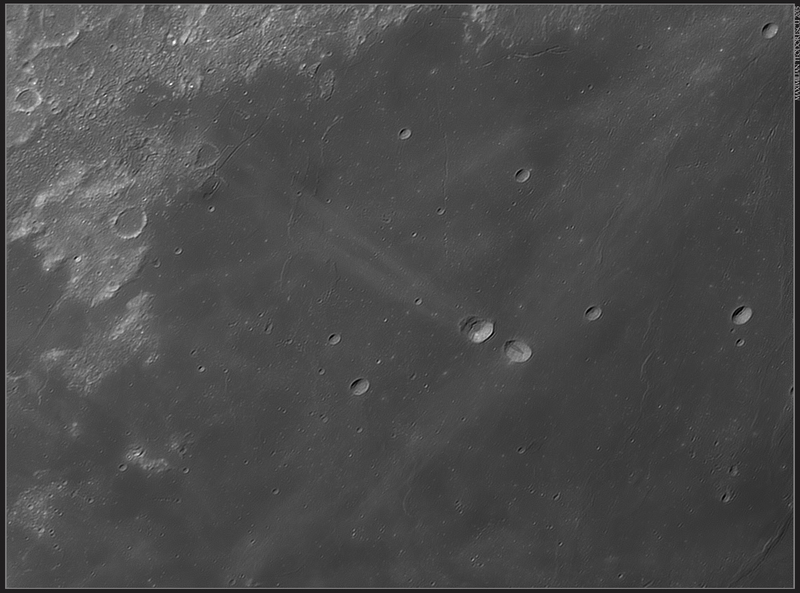 The seeing conditions were good, but the fog and the low altitude of the nebula almost destroyed the result. 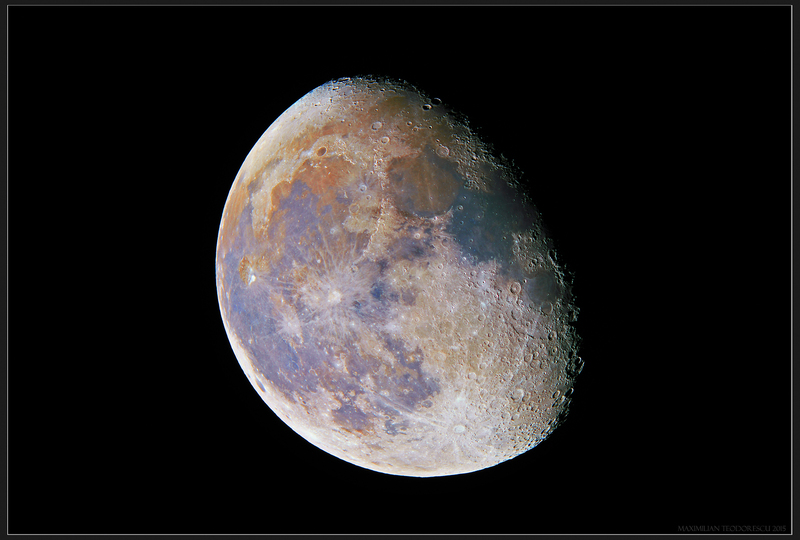 The colors in the image come from an older image, with a bit more processing and a different color balance. At a second look, I saw that some proplyds (proto-planetary discs) were well visible in the image. 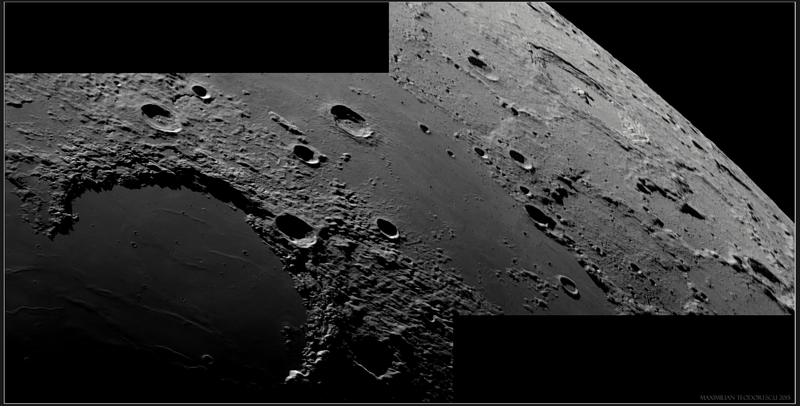 At the end of August and beginning of September, Adrian Sonka invited me for some imaging sessions at the Astronomical Institute of the Romanian Academy, placed in Bucharest. Usually, I would refuse any type of astronomical imaging from inside large towns due to light pollution and bad seeing conditions that are a trademark for such locations, but this time the size of the scope which we were to use was all that it took to lure me towards the capital of Romania. The telescope itself is a half-meter (500mm, F/15) Cassegrain, placed well inside the Observatory’s yard, surrounded by enough trees to be partially shaded from light pollution and local seeing variations. 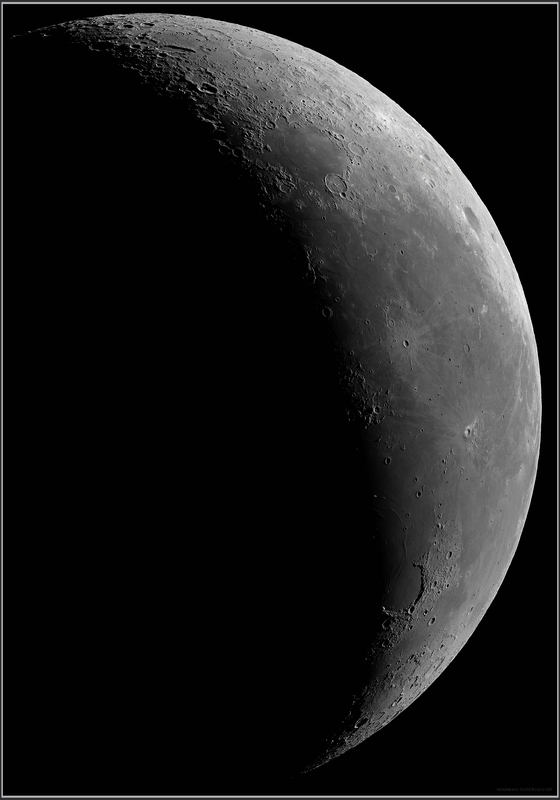 The very first session occurred on August 25th, with Saturn and the Moon placed rather low in the sky, but with some of the best seeing conditions that Bucharest has ever allowed. Following are two views of Saturn, in both Red light and RGB color, with some fine details visible, like the Encke division. At the moment of the imaging session, Saturn was only 25 to 28 degrees above the horizon! 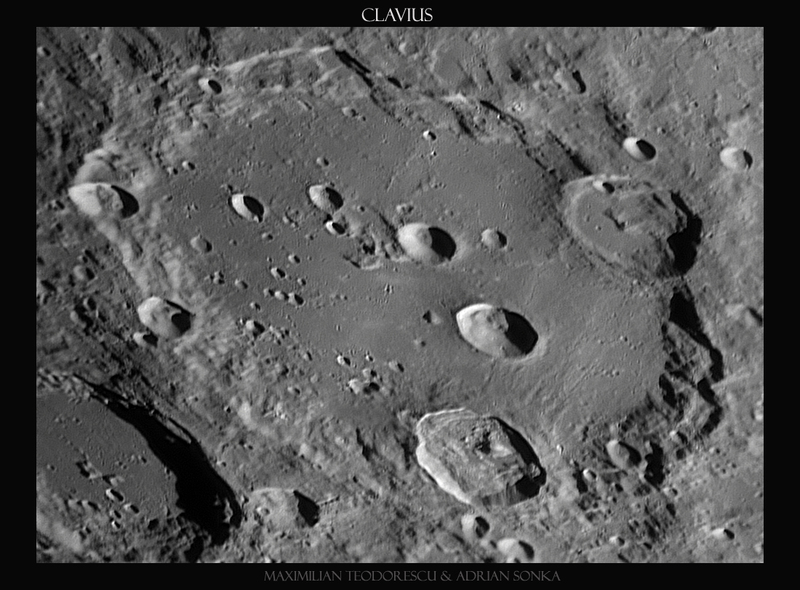 Next, a detailed view of crater Clavius, with some image distortion due to the low altitude of the Moon. 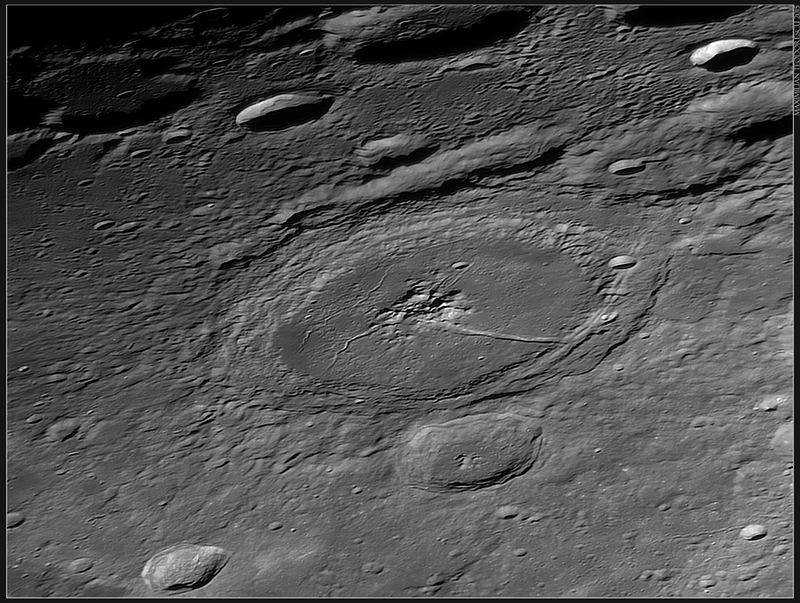 Following are some lunar shots acquired with the 14 inch F/5 homemade Newtonian at F/15 and the ASI 120MM-S camera with a Red filter, in 6-8/10 seeing conditions.